Travelling in and out of Bangkok can be daunting but it needn’t be. 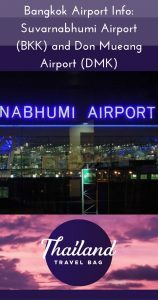 Here we give you all the information you need to get to and from Suvarnabhumi (BKK) and Don Mueang (DMK) airports, which are the two airports of Bangkok, and also give you some helpful maps, timescales and tips. This information was last updated on 17 March 2015. The first and best tip we can give you is that if you arrive into either airport between 00.00 and 05.00am and need to either transfer airports, get into the city or transfer to a mainline train or bus station, we recommend you take a taxi. Make sure you take a metered taxi as a private taxi service (which is heavily touted) will cost you 3 times more. A metered taxi is relatively cheap and will cost you a maximum of 350 baht to take you anywhere within the city limits of Bangkok or to the other airport. If you don’t want to splurge on a taxi there are limited buses that run through the night and they are covered below via the official airport websites. Bus/mini van prices range from 5 baht to 100 baht but take care getting dropped off at your destination in the early hours of the morning. Buses and minivans are a really great budget option during the day. If you need to transfer between Suvarnabhumi and Don Mueang, you can take a free shuttle bus which takes about 50-60 minutes to get from airport to airport, and runs between 5.00am and midnight, or for a quicker transfer time of 30-40 minutes take a metered taxi. The free shuttle bus leaves Suvarnabhumi Airport on the 2nd floor outside door 3. The free shuttle bus from Don Mueang leaves and arrives outside the terminal and is easy to spot. When you arrive at Suvarnabhumi the bus stops on the 4th Floor near Gate 5. The service is ‘first come, first served’ and if the bus is already full you have to wait for the next one so factor that into your transfer time. 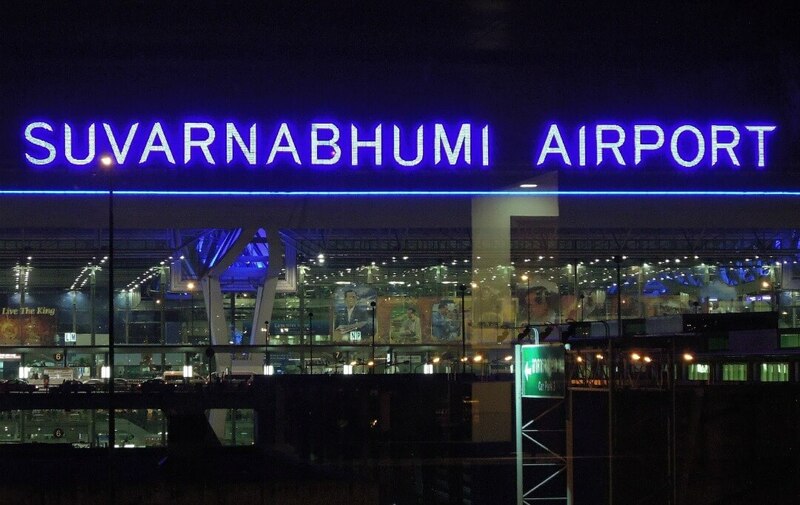 Suvarnabhumi Airport is located in an area called Bang Phli, about 25 kilometres east of downtown Bangkok. Motorway no.7 connects the airport to Bangkok City. There are lots of options for getting into the city but again, if it is after midnight your options become pretty much limited to taking a metered taxi or navigating the limited (but much cheaper) night time bus and mini van system. You queue for a metered taxi on the lowest level of the airport. A stopping City Line terminates at Phaya Thai Station, calling at 8 stations on it’s way. This map shows the Skytrain, (BTS) underground metro (MRT) and Hua Lamphong Train Station which is where you take the train to Don Mueang Airport. You can take a mini van, a public bus or an air conditioned bus and the best way to find out which route you want to take and what time they run is to check out the official Suvanabhumi Airport website. They keep the information up to date and it is the most comprehensive listing. You should view the pages for Bus Bor Khor Sor, Bus BMTA and Public Van. These mini vans and buses also travel directly from the airport to other cities within Thailand. Prices start from as little as 5 baht. Don Mueang is the smaller airport of Bangkok mainly serving the low cost South East Asian carriers and domestic routes. It is 25km aways from Bangkok which is around a 40 minute drive north from the main city of Bangkok. If it is after midnight your best option is to take a metered taxi to the city. The approximate fare from the airport to the city of Bangkok will be about 350 baht. Don Mueang Airport is 55km away from Suvanabhumi Airport and the transfer between them is covered in a section above. A train service runs from Don Mueang Airport between the hours of 06:00-21:00. The station is 500 metres from the airport and is clearly signposted. From Don Mueang Train Station you can take a train to Hua Lamphong (Central Railway Station) in central Bangkok (see above map). Trains run every hour and take around 1 hour to reach Hua Lamphong Train Station. These trains are not air conditioned and are busy because they come in from well outside the city, so this is not the most comfortable option but can be fun. During the daytime taking the bus is the best option for getting into Bangkok. The ideal option is to take a 20 minute bus ride to Mo Chit Skytrain Station (BTS) and then take the cheap and airconditioned Skytrain (BTS) for the rest of your journey. The official website for Don Mueang airport gives you the bus options, including a bus to Khao San Road, although doesn’t tell you what time they stop running in the evening. If you want to get from Don Mueang to Khao San Road, taking the bus is logistically simple compared to other options (apart from a metered taxi) but make sure to ask the driver to tell you where to get off. Bus/minivan fares range from 5 baht to 100 baht. Don’t get flustered once you arrive onto the concourse, get your bearings and look around you for well placed signs. Leave plenty of time to get to and from the airports of Bangkok and if you are heading to the airports for a flight out of Bangkok, double check which airport you are flying out of.